Leaving from Matera’s “Sassi” and the rock caves and stone houses, you will reach the Itria Valley, a karstic land also called the Valley of the Trulloes due to the thousands of “trulli”, limestone dwellings that are remarkable examples of drywall constructions offering a prehistoric building technique which is still in use in Apulia. All around you there is an explosion of colour, olive trees and ancient farmhouses. 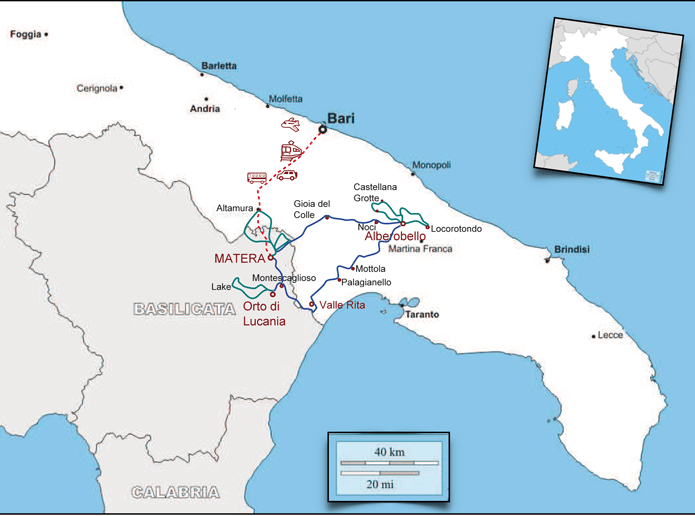 Back to the mysterious land of Basilicata, a slow ride from the rolling hills of the Bradano Valley, to the natural oasis of San Giuliano Lake and back to Matera. The South of Itay’s natural beauty, ancient culture, deeply-rooted local traditions, genuine Mediterranean food and above all the warmth and hospitality of its people, will capture you and leave you with an unforgettable feeling. Arrival in Matera and transfer to your hotel. 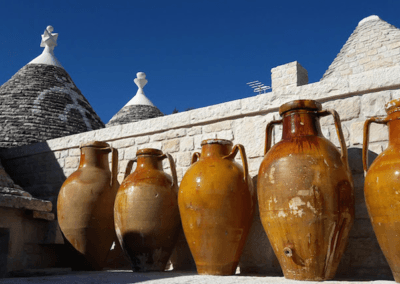 Suggested (not included): guided tour around the Sassi – a UNESCO world heritage site since 1993 – with its small streets and squares, caves, rock churches and cellars. Two districts built from the Medieval age through to the last century. We suggest you have dinner at one of the Sassi’s typical restaurants. Overnight stay. 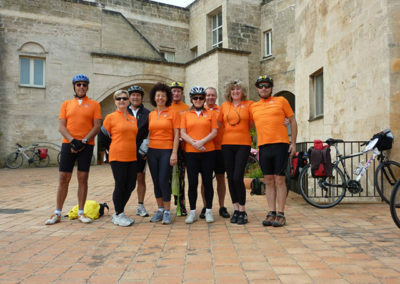 Distribution of bicycles, briefing and departure for Alberobello. 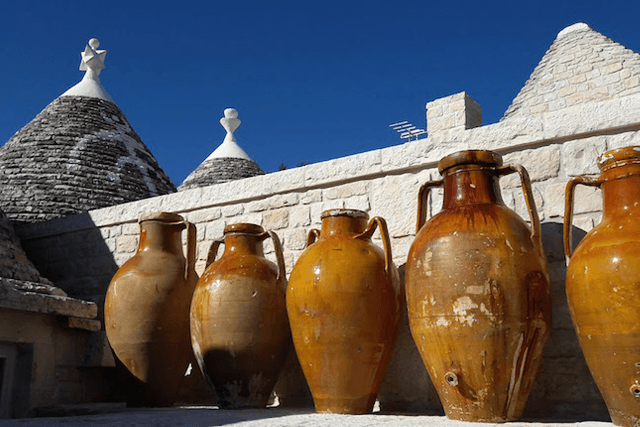 You will pass through the small villages of Gioia del Colle and Noci and on to Alberobello, the capital town of “trulloes” and a UNESCO world heritage site. 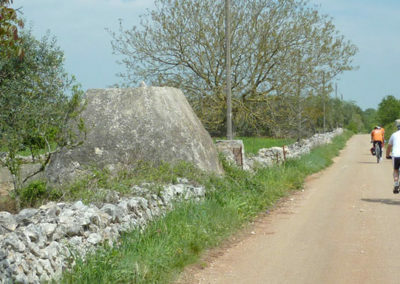 Accommodation in the historical centre in a trullo dating from 1600. Overnight stay. 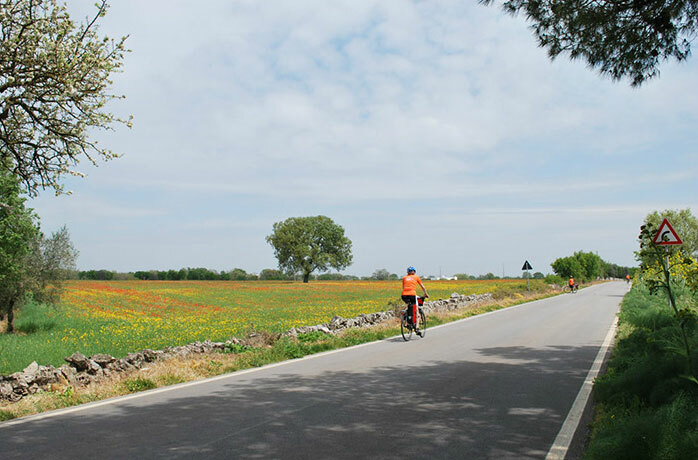 Heading south into the Taranto province, you will pedal through deserted roads and vineyards. You will cross the Land of the Ravines and the villages of Mottola and Palagianello. The Ravines are deep precipices, often more than 100 metres deep, similar to canyons. Overnight stay in a farm not far from the Bradano River. 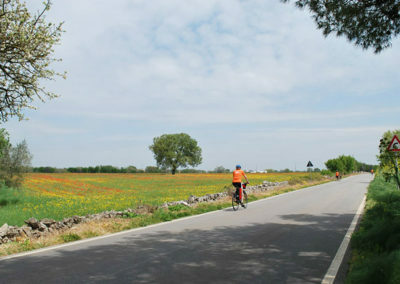 Today you will continue pedalling along the Bradano River through vineyards and orange trees. After a light ascent on the Montescaglioso hill (a visit to the Benedictine Abbey is a must), back to the valley again and overnight stay at a holiday farm specialized in producing vegetables. Relax in the swimming pool. Today you can enjoy cycling loop in the valley or relax by the swimming pool. 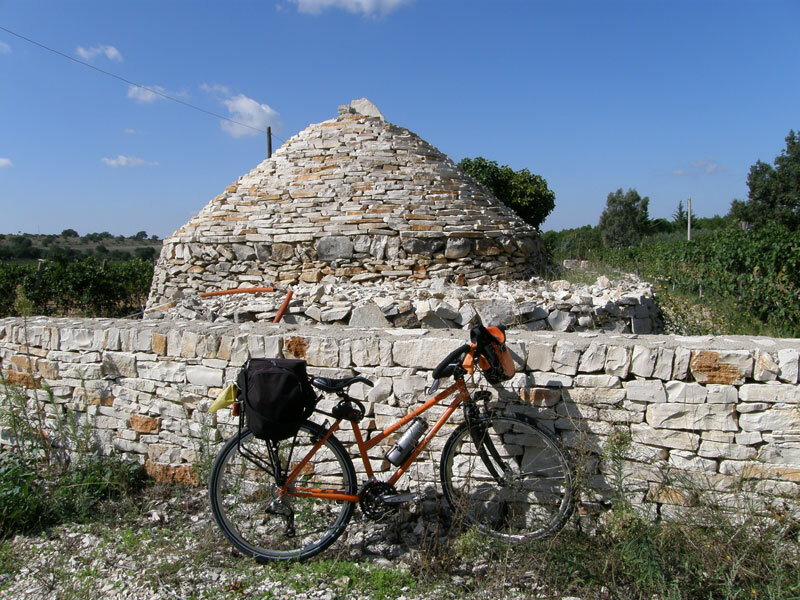 Cycling along the ancient “Via Appia” (an old Roman road), you will pass through the charming medieval village of Miglionico, with a nice view of the valley. Back to Matera with climb skirting the Park of Rock Churches again. 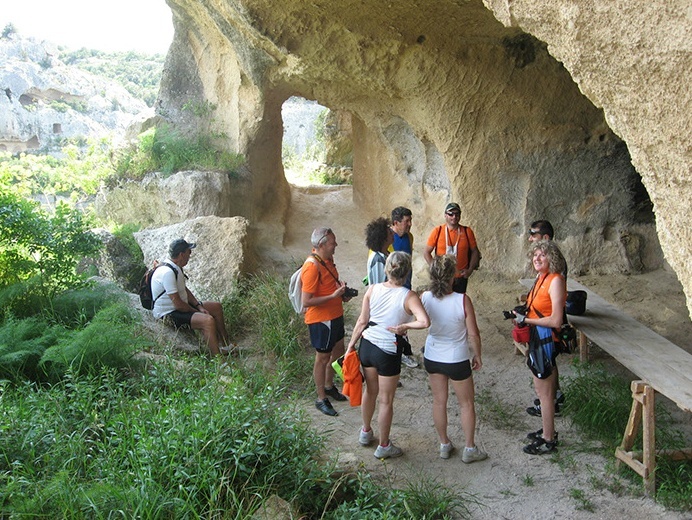 Free afternoon for visiting museums, walking in the Sassi and enjoy your dinner in a cave restaurant. Total length: 280 km, with stages from 25 to 64 km to be done in 3 – 8 hours within the day. 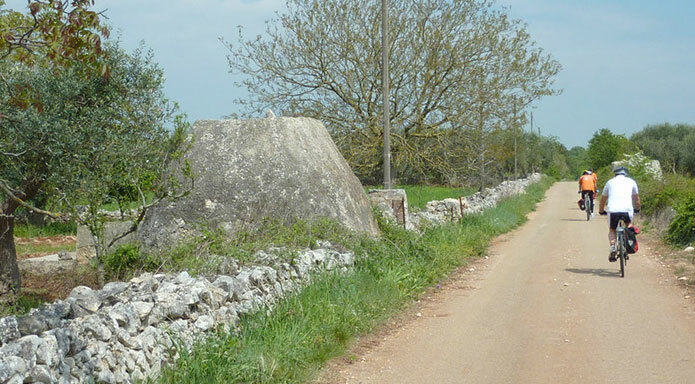 7 nights in double rooms with breakfast, luggage transfer, technical and emergency assistance, road book and maps. Medical/Luggage insurance, minivan assistance, drinks, lunches and dinners, entrance fees, tips, personal extras, everything else which does not come under the heading “the fee includes”. 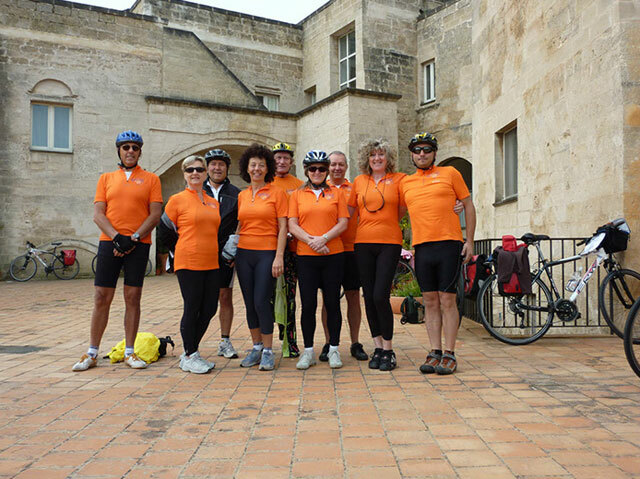 7 nights in double rooms, 7 dinners, all transfers from/to Bari airport, cycling guide, luggage transfer, guided tour in the Sassi of Matera, technical and emergency assistance, road book. Medical/Luggage insurance, minivan assistance, lunches, drinks at dinners, entrance fees, tips, personal extras, everything else which does not come under the heading “the fee includes”.